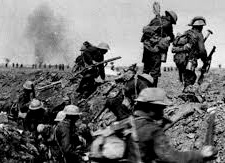 Britain declared war on Germany on August 4th 1914 after the German army had invaded Belgium. 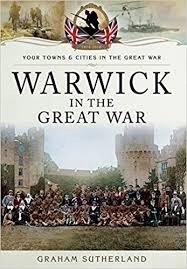 Men of the Royal Warwickshire Regiment (RWR) and the Warwickshire Yeomanry (WY) were immediately called up and thousands were mustered in the county town of Warwick. The Army Pay Corps (APC), the administration organisation for the troops, set up its regional office in Pageant House in Jury Street. With 350,000 men assembling from across the county, the APC soon needed more than 300 staff and expanded their offices into The Court House. The RWR was based at Budbrooke Barracks which was soon full, and many soldiers were billeted in the town. There was no shortage of offers to accommodate troops, not only because of patriotic spirit, but also because the army paid 17s 6d a week for a private’s full board. Pressure on accommodation also came from Belgian refugees who had poured across the channel as the Germans invaded. Two hundred were sent to Warwick. 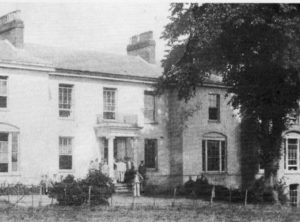 They were first housed in part of King’s High School in Myton Road, then in Durban Villa in Emscote Road. 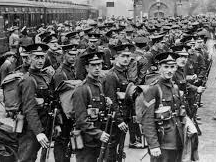 The third battalion of the Warwickshire Regiment left soon after war was declared, seen off at the station by a large crowd. They would soon be fighting in Mons. By March 1915 more than 300 officers and men from the RWR had been killed. 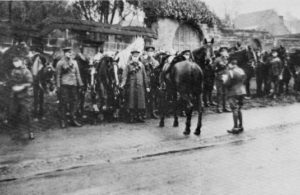 The Warwickshire Yeomanry (WY), the volunteer cavalry who had served in the Boer War, gathered at St. John’s and in The Butts, and used the Woolpack as their HQ. They were sent to Alexandria and fought in the Middle East for much of the war. In 1917 they took part in the famous charge at Huj, a Palestinian village near Gaza, when they faced Turkish, German and Austrian artillery. The cavalry charged the guns, and despite heavy losses captured the position. It was the last unsupported cavalry charge in the history of warfare. One of the captured guns can be seen in the Warwickshire Yeomanry Museum in the Jury Street Court House. Back home in Warwick there was a call for volunteers led by Rev. Alan Williams of St. Mary’s Church who addressed a mass meeting in The Square. Warwick Borough Council began publishing a Roll of Honour in the Advertiser with the names of those who had signed up, perhaps to shame those who had not yet done so. By the end of 1915, more than eight hundred men from the Warwick and Leamington District has ‘taken the King’s Shilling’. The Warwick casualty lists published in The Advertiser grew longer, with sparse details. Soon soldiers who had been evacuated from France with serious wounds or shell-shock began arriving at Warwick Station. The local hospitals couldn’t cope. Warwickshire began with 180 hospital beds; soon there were more than 2,000 and large houses were taken over by the Red Cross, among them Guys Cliffe House and Hill House. Hundreds of local women volunteered as nurses. As the losses on the Western Front mounted, conscription was introduced in early 1916, with profound effects on the home front. German U-boats were devastating merchant shipping bringing supplies to Britain and there were food shortages. The government urged farmers to produce more and encouraged everyone to grow vegetables. But as more agricultural workers and horses were sent to the war, the harvest was in jeopardy. 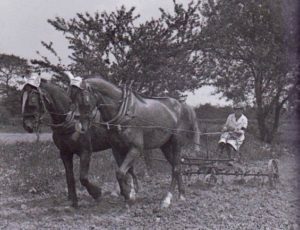 The Warwickshire War Agriculture Committee was formed to oversee increased food production, and recruit women to the Land Army. In 1917 the government introduced voluntary rationing. The proclamation was read from the steps of the Warwick Court House by the mayor. But a year later compulsory rationing had to be introduced, administered by the local Food Office at 26 Jury Street. There were cookery lessons at Westgate School and a ‘National Kitchen’ at St. Paul’s old schoolroom in Theatre Street providing low-cost meals. Coal was also rationed depending on the number of rooms in your house. The number of Warwick casualties rose relentlessly with their names being pinned to the railing of St. Mary’s churchyard. By November 1917 over 150 Warwick men had already been reported killed. On November 10th 1917, a memorial service was held at St Mary’s church, and mirrored at other churches in the town, with the names of each of the dead read out from the pulpit. The Warwick Advertiser’s report on the St Mary’s service commented, “most people in the church must have been appalled at their number, and by what the list must mean in that sense of bereavement which has come like a great shadow over so many Warwick families”. When the Armistice was agreed and fighting stopped on November 11th 1918, there were celebrations in Warwick which went long into the night and a straw effigy of the Kaiser was hung from the tram wires in the High Street. A German gun captured by the RWR was displayed in the Market Place. When peace was officially declared in 1919, drunken soldiers dragged the gun to St. Nicholas Meadows and pushed it into the Avon. But celebrations were muted because of the number of bereaved families. The number of names displayed on the railings of St. Mary’s churchyard had passed two hundred. A committee was formed to consider a permanent remembrance to the Warwick dead, and in 1921, the Warwick War Memorial in Church Street was unveiled. Over the years more names have been added as they have been discovered in the records, often by families doing their own genealogy. There are now more than 350 names from The Great War.